Meet the princess who'd rather wear a suit of armor than a crown! 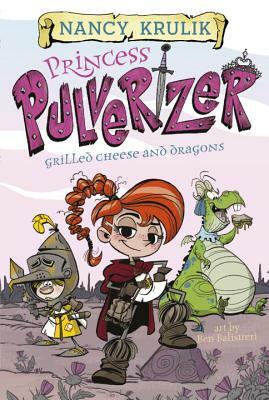 Princess Serena (or as she prefers, Princess Pulverizer) doesn't want to be a princess--she wants to be knight! But her father, King Alexander of Empiria, thinks she still has a lot to learn when it comes to exhibiting valiant behavior. So he presents a challenge: the princess must first go on a Quest of Kindness and perform good deeds to prove that she truly deserves to go to knight school. With help from a friendly dragon named Dribble and a perpetually terrified knight-in-training named Lucas, can she complete her quest and discover what it really takes to be a hero? Nancy Krulik is the author of more than two hundred books for children and young adults, including three New York Times Best Sellers. She is best known as the author and creator of the Katie Kazoo, Switcheroo; George Brown, Class Clown; How I Survived Middle School; and Magic Bone book series. Nancy lives in Manhattan with her husband, composer Daniel Burwasser. When she's not writing, Nancy can be found reading, going to concerts, traveling, or running around Central Park with her crazy beagle mix, Josie. Follow her @NancyKrulik. Ben Balistreri has been working for more than twenty years in the animation industry. He's won an Emmy Award for his character designs, and has been nominated for nine Annie Awards, winning once. His art can be seen in Tangled the Series, for which he serves as Supervising Producer, How to Train Your Dragon, Danny Phantom, Foster's Home for Imaginary Friends, Wander Over Yonder, Wild Kratts, and many more. The Princess Pulverizer series is his first foray into book illustration. He lives in Pasadena, California, with his wife, Becca, and their two golden retrievers, Bombadil and Fatty Lumpkin.